Last semester The Ryerson Folio team worked super hard to get the first ever physical issue published for all the world (more like Ryerson population) to see! Apparently it looks amazing (I haven't set foot in Toronto since end of term and so I have not actually seen the magazine BUT IM EXCITED ANYWAY!) and I congratulate my fellow masthead members for all their hard work! Check out the online version on the Folio website! For those of you don't know, I am the fashion editor at Folio. For the first issue, I pushed to make sure the fashion section was top notch and as vogue-esque as possible. None of this sad model/bad makeup/H&M clothes/whoever photographer business. I wanted professionals. And that is what I got. Thanks to designer Lucian Matis (one of Ryerson University's famous fashion alumni), from whom I pulled the majority of the pieces I used to style our glorious runway queen Mikayla Mifsud, Folio's first ever fashion spread looks absolutely FASH ON baaaaaybeee! Greatest thing about styling: secretly wearing (for only 5 seconds of course) that designer piece you've been drooling over since you first saw it on the Fashion Week Runway. Woooohooooo! 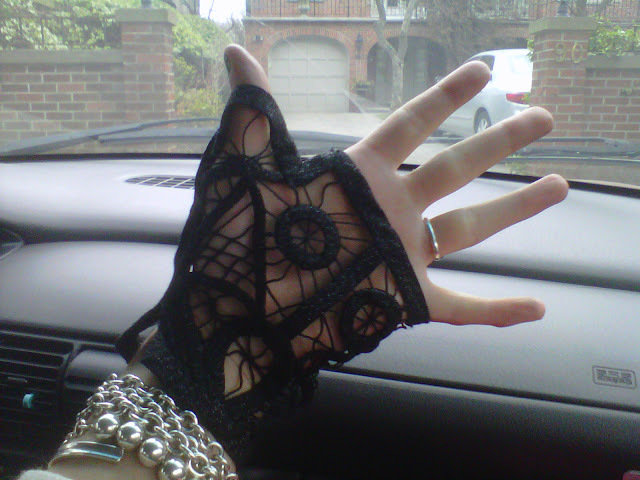 I got to wear the Lucian Matis lace gloves! The exact ones I obsessed over and wrote about for Dress to Kill! ....I wore them for about 10 minutes...for the ride back to the studio. BUT STILL! SOOO SICK. Here's a little behind-the-scenes video of the shoot. ENJOY! Ryerson Folio Magazine Fashion Shoot - Behind the Scenes from Ryerson Folio on Vimeo.